With the exhibition circuit well and truly in flow. I have been thinking about some of the magnificent work that I have seen on the circuit and some of the not so great layouts as well. 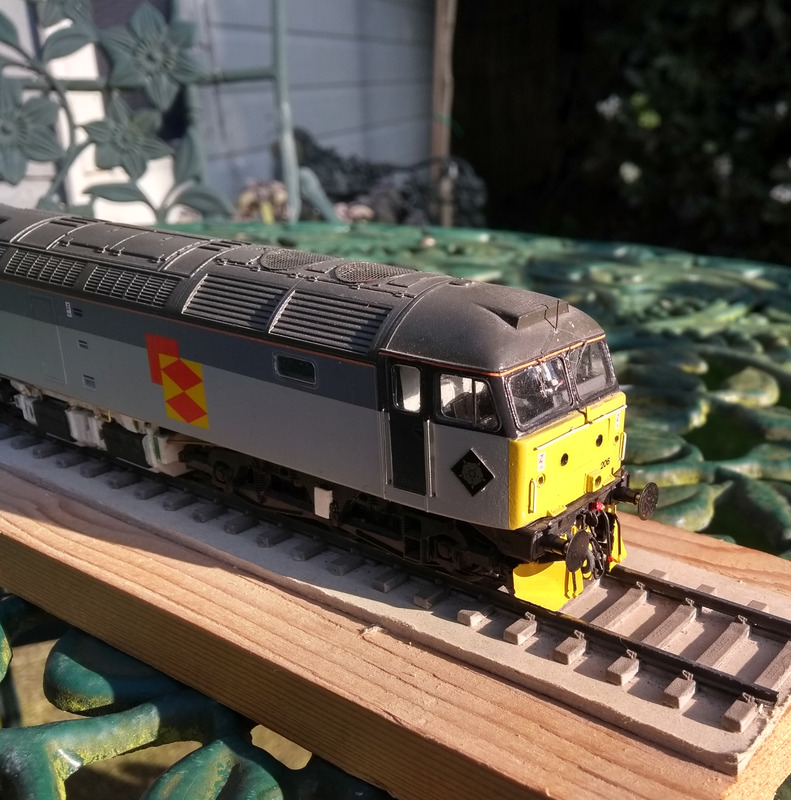 It is great to locomotives and rolling stock looking fabulous either repainted or weathered to a high standard along with realistic looking back scenes with lots and lots going on. The plans for West Halton are well advanced and the research is 100% complete. We have a very good Library of information to fall back on. I have built up a collection of Freight and Passenger Working Timetables from 1960 to when the last ones were published in 2007. Along with these I have trip working booklets and notices, these was issued to Drivers, Second men and Guards. These documents can often reveal nothing, but they can be a wealth of information and give instructions for how trains should be marshalled and at what locations traffic will be picked up and dropped off and what traction should be used. They can also just say such information like “Work to yard Supervisors instructions” Or “work as directed by the weekly coal plan”……… Cheers then! 6J40 SX 12:34 Scunthorpe Ent ‘C’ – Tinsley N.Y. to run with a maximum of 50 SLU of traffic. I know that I am very privileged to have acquired this information and it really is worth its weight in gold at times. This information along with books and magazines from the period that you choose to model are invaluable! The pictures that you find can really help you and make you think…. Yeah ill have a crack at doing a kit of that wagon. I know it has done that to me and those obscure books and odd pictures you find in Rail Magazine when it was a decent read can really help you along. Even more so with the long dark nights in front of us for the next few months! When I was kid two Authors got me hooked on the “Freight Railway” Dr M Rhodes and Paul Shannon. The “Freight Only” series of books along with the Freight Only Yearbooks and Freightfax books to me was just brilliant and truly inspiring and sadly today show just how much traffic has been lost from the railway. All this waffling has got me kinda away from the point of the post and that is…………. If you want your layout to look like the real thing, then research the area the subject the locomotives that operated in the area. The traffic flows the consists or make up of the trains, so you get them as you want them to look. Also think of the operation think “How would this train run round move on the real life railway”. If you are happy with just watching the trains run around a loop of track then that’s fine too. Yesterday the local DB Cargo management for West Yorkshire and Humberside. Held a very small open day at Knottingley Depot the proceeds of witch have been donated to a Cancer charity. It took some moves but the was host to a small number of visiting locomotives. DB Cargo had 60015, 60066, 66082 67029 on display. 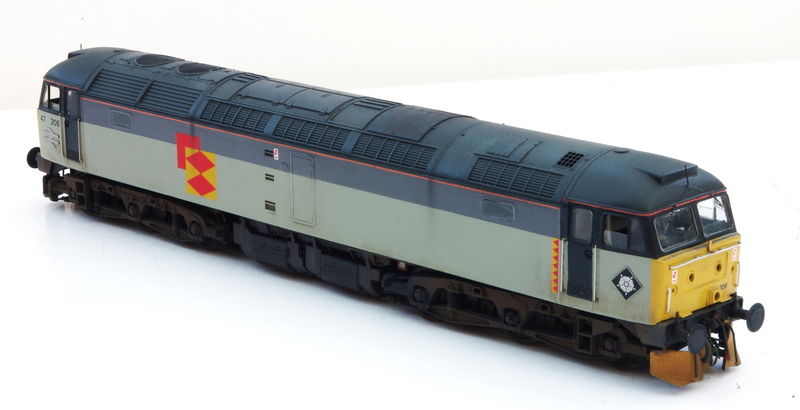 The Deltic Preservation Society kindly sent 55009 & DC Rail sent 56303. 56303 When it carried a proper TOPS number was no stranger to Knottingley being part of the once 45 strong Aire Valley Coal Pool. 56303, 60015, 66082 & 67029 Knottingley Depot. After the crowds had gone a few members staff with far too many lights decided on a private night shoot of the locomotives. Some nifty shunting was done. This is the result! I think you will agree it is very similar to fabulous nights shots that the Roundal Design Group did for British Rail when they launched the Railfreight sectors 30 years ago. Railfreight Sectors Launched 30 years ago today!! Whilst watching the News yesterday and watching the story about the devistation caused by storm Ophelia it dawned on me that it has been 30 years since the Railfreight sub sectors had been launched. Launched on the 17th October 1987 at the Ripple Lane Open Day. British Rail unveiled its new Railfreight Sectors. The event very nearly never happened thanks to the “Great Storm of 1987”. The hard work and dedication of the local staff ensured that the event did take place. The new sectors very striking and forceful made the mundane BR Blue and Railfreight Grey and Red Strip before it look very beige……. That is my view on it as seeing shiny class 37s and 47s and 56s in the new paintwork looked amazing even with dirty and weathered wagons behind them! 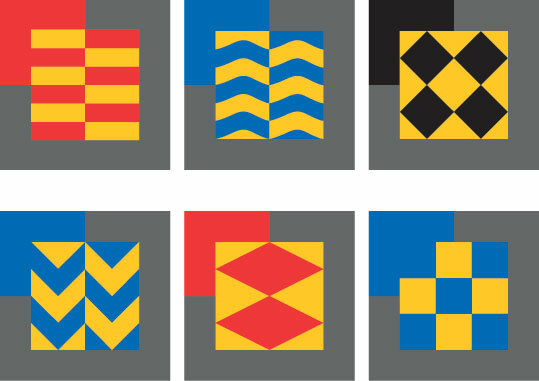 Each of the new sectors of Railfreight had its own head quarters its own allocation of staff, its own allocation of locomtoives and wagons and depots both for train crew and its locomotive fleet. More importantly each sector had responsibility over its own budget and along with its own set of targets to achieve. The ruling government a target that each sector needed to make a 8% profit on the flows that they operated. This sector was the sector for anything that didn’t fit into the other sub sectors that involved bulk movement. Railfreight General handled the “Speedlink” wagon load traffic and one off special moves and such like. This sector only lasted till 1989 when it was absorbed into the Railfrreight Distribution portfolio. This sector was responsible for the movement of Oil and some Chemical flows. Its main areas of operation was the in Essex moving vast tonnage from Oil Refineries at Thames Haven & Coryton, South Wales concentrating around Milford Haven and Robestone Oil Refineries, North West England moving traffic from Stanlow Oil Refinery, South Humberside moving vast tonnages from the two refineries at Lindsey and Humber along with other oil based products from the various tank farms and processing plants. Teesside with vast tonnages being moved from Haverton Hill and Seal Sands and North of the Boarder with vast tonnages from Grangemouth Oil Refinery. On top these flow Railfreight Petroleum moved healthy flows of crude oil around Hampshire and various types of Gasses from North Lincolnshire, Essex and South Wales and Hampshire. 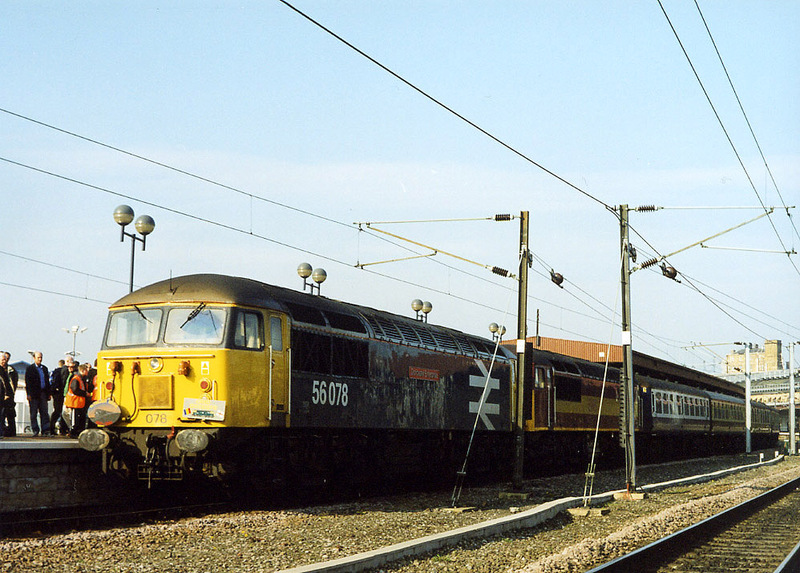 Railfreight Coal was by the biggest of the railfreight sectors it had the biggest locomotive fleet, largest fleet of wagons and largest amount of staff. 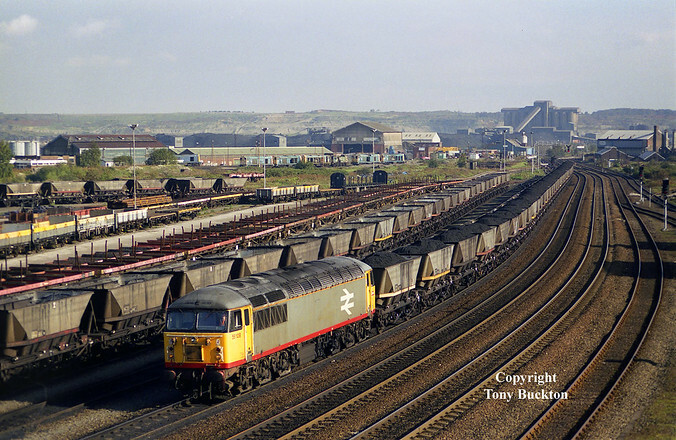 Railfreight Coal moved a staggering 91 million tonnes of coal per year when the Railfreight Sectors came into force. The sector delivered coal from Collieries to Power Stations and to Coking plants. It moved smokeless fuels and it also had its own wagon load network for delivering coal for domestic and industrial use. The sector was also responsible for movement of Nuclear waste traffic from various sites in the UK to Sellafield for reprocessing. This sector was responsible for movement of all steel traffic within the UK. The sector was responsble for the movement of the raw products such as Iron Ore and Limestone and Coal. As well the finished and semi finished products through the UK. Its heavist areas of operations was in South Wales, The West Midlands, South Yorkshire, Northern Lincolnshire, Teesside and the Central Belt of Scotland. The sector also had the movement of components for the Automotive industry as well as finished Automotive’s the movement of Automotives was soon moved to Railfreight Distributions portfolio in 1989 when it also absorbed the Railfreight General Sector. This was the second biggest sector and from 1989 its Portfolio boasted traffic from single wagon loads of traffic through to sleek containerized goods and traffic going to and from mainland Europe. Railfreight Distribution area of operation really was UK wide and it boasted the most diverse fleet of locomotives out all the Railfreight Sectors. The Construction Sector was responsible for moving raw materials from quarries to distribution centers block trainloads of Lime Stone, Granite, Sand and Shale was the main products moved. Railfreight Constructions main areas that generated vast tonnages was from the Mendip quarries at Merehead and Whatley, The Leicester area quarries and quarries found in the Derbyshire Peak District. The sector also moved products such as Cement and Bricks and gypsum. It also had the task of moving household waste from Inner city areas to Landfill sites the majority of witch had been quarries or clay pits before they had been worked out. This is a little bit about what me James and James Wells would like to achieve in building West Halton Siding’s. A lot of people will know already that James Wells is a very accomplished modeller in P4. He has done a lot of commission work in the past and will still do the odd commission when time permits. As for me James Skoyles well……. This is going to be a challenge! 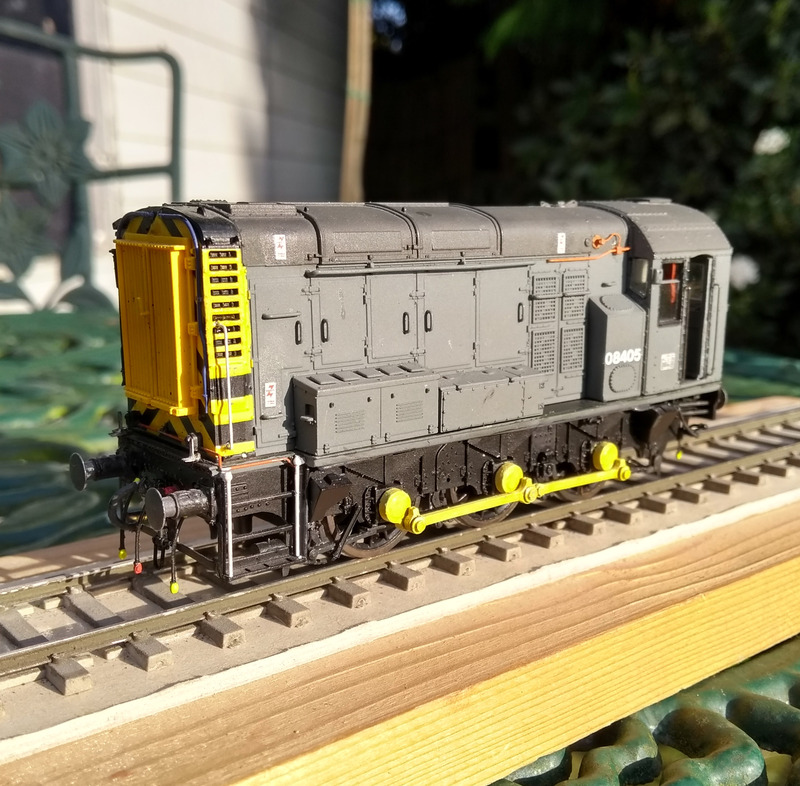 I do not possess the same level of craftsmanship like James Wells does and this is my 1st venture into modelling the finer scale of 4mm modelling. I am sure without a shadow of a doubt the pathway will not be easy it will be very hard in places. I am quite prepared for the struggles and hopefully the triumph in creating this exhibition standard layout and we both hope that we in time will be able to create other exhibition standard layouts in the fullness of time. James has touched on why a small pocket of North East Lincolnshire in the very early 1990s! Why for me do I feel the same? To me the area had something special about it. I have been born and brought up in Hull all my life and in my formative spotting years the area did not have much going for it. The Chemical Plant at Saltend produced a small amount of rail traffic in the form of Acid Products and Imported Coal started to feature along with the long running “Tilcon” Road Stone train. A 20-minute journey over the Humber Bridge to Barnetby – Le – Wold and it was a different story altogether. You had a constant precession of Iron Ore and Coal traffic feeding Scunthorpe Steel Works. Oil trains, Steel Trains heading to and from Immingham Docks and the Two Oil Refineries. The variety of traction used for a young kid wanting to underline loco numbers in his Platform 5 book was amazing! 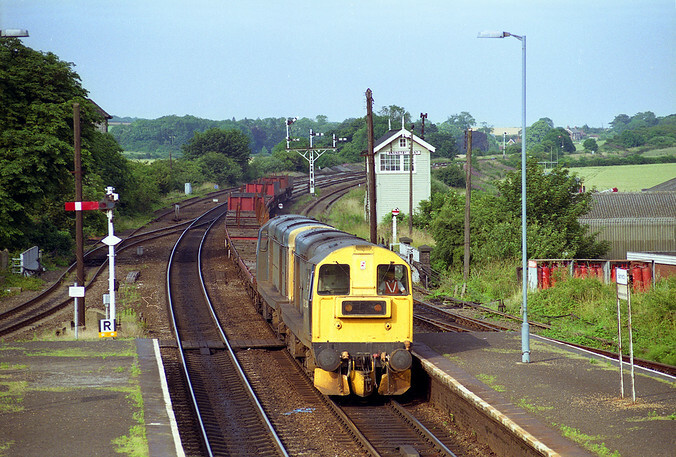 Class 20s, 31s, 37s, 47s, 56s, 58s, and the then new class 60s it was utopia! For someone living in Hull watching the class 20s in the twilight years and the new form of heavy freight loco. The infrastructure as well was outdated it had not then being swept away. The signalling was still mechanical and the line speeds low and 60ft jointed track in places. The sound signals clanking to the “Off” position and wires and point rodding being moved it was all so very magical and very much real! Along with the sounds of pairs of class 37s on 2,000tonne Iron Ore trains doing battle with Santon Bank after seeing the train disappear around the corner at Wrawby Junction some 10 minutes previous. Also hearing the empties return in the same fashion, and watching the Barnetby Pilot whistle to itself making up engineers traffic in the down sidings just magic! I was very lucky enough to befriend a local Signalman in the area who was a resident Signalman in Barnetby East. I spent more time than I care to remember in the box and this was where my interest in Signalling and Railway Operations really started to grow. Virtually every Saturday I had questions on some element of the Signalling rule book it was never a dull Saturday or Sunday! I also saw 1st hand how a signalman in a busy box works the box. These men can take multi-tasking to another level. I have seen the signalman write entries in his Train Register whilst on the omnibus circuit phone discussing what traffic is coming and what order they will be going in, as soon as he puts his pen down whilst still on the phone discussing the order of trains he is clearing his signals and working the block instruments and bells. Watching this spurred me on to get a job on the Railway and I did this. Sadly not working in the Immingham or Scunthopre are but heavily involved with Freight traffic in the area as well as the rest of the UK. My interest in Freight traffic has lead me to collect lots of Working Timetables and Local Area Trip Notices and Sectional Appendices and Special Operating Instructions and Working Manuals and we both hope to run the layout as accurate as possible as we both see fantastic layouts on the circuit. The stock and locomotives the scenery are all fantastic everything looks right, However, The operation is not and I don’t know if it is us being professional railwaymen being over critical but it lets a layout down slightly. Anyway, enough of me waffling on thank you for stopping by.